At Riddell Kurczaba, we know that great leaders never walk alone. That’s why RK’s interdisciplinary leadership team has always maintained its commitment to open communication and collaboration—not only with each other, but also with colleagues and clients—to ensure that every project benefits from a wealth of industry knowledge and expertise. We use partnership as the foundation for our projects, and organization as the building blocks. These aspects are critical in maneuvering in and around potential project obstacles, and further aid us in making sure no resource goes untapped. We strongly believe that our firm’s partnership and leadership models are our secret power, helping us manage a constructive, trust-worthy, and confidence-inspiring project process. Ron is a Founding Partner of Riddell Kurczaba. A professional engineer by trade, he is fascinated by the evolution of the applied arts, which reflects our civilization’s propensity to create those objects that are at once functionally and aesthetically pleasing. In this synthesis between technology and art within our built environment, he has dedicated much of his 32+ year career in engineering and project management to help bring these ambitious undertakings to fruition. His professional achievements include receiving Project Management certification in 1989 and being one of the founding members of PMI Canada. Ron has also contributed much of his time to supporting the work of several not-for-profit, community-based organizations. Since 1998, Niha has been central to Riddell Kurczaba's strong profile and success in the building industry. She relies on an illustrious Human Resources background and keen business acumen to build and manage relationships with clients and supporters, and for marketing the business. Niha is well-recognized in industry circles, and always works resolutely at reinforcing and improving the solid public image of the firm. Peter is an Architect at Riddell Kurczaba who possesses 20+ years of professional architectural experience with a rich variety of different building portfolios. He studied architecture at the University of Applied Sciences Dortmund and completed his Masters of Architecture in 1996. After having practiced as a licensed and registered Architect in Germany for numerous years, Peter joined Riddell Kurczaba in Calgary as a Designer, deftly applying his contemporary design approach; passion for sustainable design, urban renewal and restoration of historic places; and strong ability in analyzing and solving complex program requirements to myriad projects. Paul is a Project Management Professional and Architectural Technologist with more than 27 years of industry experience. He is a stabilizing force in the delivery of projects, approaching tasks at hand in a practical, systematic manner in order to get the job done right. Prior to joining Riddell Kurczaba, he worked as a Project Manager and Architectural Technologist for 13 years in Ontario and served as an active member of both the Ontario Association of Certified Engineering Technicians and Technologists and the Architectural Technologists of Ontario. Paul's portfolio encompasses a varied mix of private and public sector projects, including many residential, institutional and commercial buildings in Canada, Bermuda and China. As Managing Director, Tracy is responsible for the strategic, management and financial leadership of the Edmonton studio. Trained in both Architectural and Interior Design Technologies, Tracy is well versed in numerous aspects of the project delivery process, from detailing and site reviews to furniture procurement. In her capacity as a design professional, Tracy also brings immense ability to lead design teams and planning sessions; to collaborate with clients, contractors, developers and consultants; and to leverage her capabilities in three-dimensional imaging, graphic design, and architectural drafting for the benefit of clients and their projects. Her versatile skills, passion for continual learning, and dynamic and gregarious nature have contributed to her project achievements for an array of typologies in both the public and private sectors. 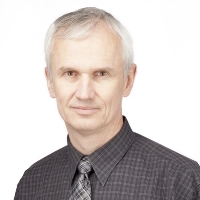 Brook is a Senior Architect who holds a Master of Environmental Design (Architecture) from the University of Calgary which he completed in 1984. An acclaimed architect and artist with 25+ years of experience in institutional, hospitality, residential, and mixed-use projects, Brook is a kindhearted and passionate leader, and also a big thinker, seeing the real, practical world as only a starting place for the possibilities of what might be. His enthusiasm for pushing design to the best it can be is the driving force behind growing and developing ideas into more than thought possible. Paul is a Senior Designer and Project Manager with more than 25 years of experience in all aspects of building design and development. He has been involved in the delivery of a wide range of project types from small individual assignments to several large, complex projects with challenging delivery and budget constraints. In either case, Paul's approach remains the same: focusing on, first and foremost, the needs of the client and providing service in a professional manner. He pays strict attention to quality control and assurance, and is very effective in the coordination of client interest groups, engineers, the constructors, and other specialists. Since 2001, he has led a team of specialists in the provision of design and implementation services on projects for Remington Development Corporation, an industry leader in urban office, retail, warehouse/ distribution, and manufacturing facilities, and commercial land developments. Nia is a Certified Professional Accountant whose talents have been utilized for the benefit of numerous for-profit and non-profit organizations in various industries. Her experience extends to all facets of business planning, management and analysis, including Financial Statements and Reporting, Budgets, Cash Forecasts, Accounts Receivable/ Accounts Payable, and Controllership advice. Nia’s accounting knowledge and upbeat, collaborative approach to problem-solving has helped streamline several aspects of Riddell Kurczaba’s internal and external processes. Kim brings over 13 years of experience and unmatched enthusiasm to her role at Riddell Kurczaba. She views each project as an opportunity to achieve a client’s goals for aesthetics, quality, and cost without compromising function or longevity. Through the use of space, materials, and furnishings, Kim is focused on creating environments that improve people’s productivity and well-being. After receiving a B.Sc. in Mechanical Engineering from the University of Calgary, Hector chose to parlay his diverse analytical, technical and creative skills into a career in communication design and management. He honed his skills through immersion in assorted fields such as journalism, legal editing, print and digital publishing, technical writing, copywriting, and branding/ identity design, and has accumulated 20+ years of both broad-based and focused experience to his credit. Since joining Riddell Kurczaba in 2001, Hector has figured prominently in elevating the standards of the firm's marketing collateral and corporate communications, and he now plays a leading role in propelling the firm's reputation management initiatives. Scott is an award-winning interior design professional with more than 22 years of diverse experience leading corporate, retail, and residential design projects in Canada, USA, Australia, Singapore and the UK. He has deep knowledge and skill in all aspects of project delivery from conceptual space planning and design development through drawing production, permitting and construction. He has amassed a large portfolio of successfully executed design projects bringing tremendous credibility and confidence to his clients and project stakeholders. Kiko provides valuable BIM leadership and drafting capabilities on a variety of projects for Riddell Kurczaba’s spectrum of clients. Her excellent understanding and application of new drafting technologies have been pivotal in elevating the Riddell Kurczaba team as the premier choice of public and private sector clients to design their facilities. Sameer possesses extensive international experience in architectural design and project management. To his projects, he brings an understanding of the full gamut of responsibilities and activities to achieve successful project delivery, from conceptual design, design development, and construction drawings to project management and construction administration duties. Sameer’s portfolio includes numerous commercial, institutional, mixed-use, residential and industrial projects, ranging in size from single-detached dwellings to major-scale facilities.